Size&Color: This play tent standings 6 feet tall, 43.3 inches long, 43.3 inches wide, 5-sided design large enough for an adult to sit inside with a child to read to them. Perfect size for an apartment or nursery room. Color kinda off-white/beige. Natural canvas color, not off white. 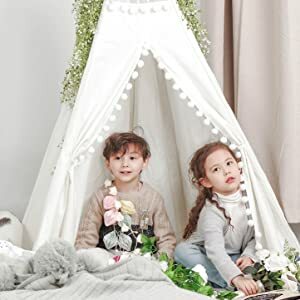 High Quality for Your Child: This teepee tents are made of 100% natural, non-toxic, unpainted cotton canvas. The tent poles are made of sturdy pine wood and are free of chemical odors and harmful substances. The best choice for your adorable boys or girls. The Uniqueness of Our Design: Use oversize pompoms, girly chic without being "over the top" fussy. Precious lace detail . Bring your Child a Convenient and Joyful Life: Easy installation being a significant feature, Conveniently assembled by a single adult. Or you can have fun installing it with your kids. Comes with carry case, made to be portable and practical, so that you can carry your child’s favorite teepee anywhere with you. 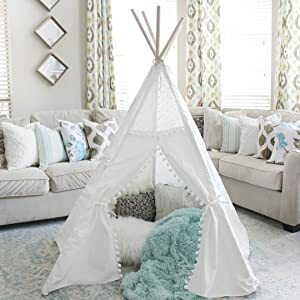 Package Contains Everything: 1 x Kids Teepee Tent, 10 x Wooden Poles, 5 x Connector, 1 x Carry Case, 1 x Anti-Collapse Kit. Five poles design, large space, enough for an adult to sit inside with a child to read, convenient for kids and their friends play inside it, also a wonderful place for preteen to have a rest. Moving the wood poles closer or fully apart to made the teepee bigger or smaller as you like. Easy Assemble, Carry Away, Store, and Clean. Easy assemble within 5-10 mins. Convenient to be folded in our carry case. Teepee and Pompoms are all machine washable and can be washed well. If any problem arises, please let us know and we'll send you a new tepee tent instead, or refund the full amount.